After learning about force and motion, students worked together to find examples of items they would find in their homes and described the motions in short video clips (students collaborated with a parent volunteer to make the videos together). Students researched, cut out pictures, and placed them in the appropriate rooms in a large paper house “blue print” displayed in the hall. Teachers then used Studio Aurasma to link the video clips to the pictures, creating ‘auras’ that could be scanned with smart phones and iPads. Parents, students, and visitors could then scan the photos on the house and watch the student videos explaining the motions of the objects, revealing a ‘virtual world’ inside the 2 dimensional house drawing. This strand was not the focus of this lesson. This lesson falls in the Ideal/Target range. Throughout this lesson, children were able to communicate and collaborate with each other, practicing their oral language skills and ability to communicate effectively. Children were able to practice using new content vocabulary and basic oral communication skills. The teachers were able to provide students with a real-life task to tackle a goal on their developmental level. Through the process, students were able to assess their own work as they determined the effectiveness of the pictures they located. Students were able to reach an audience outside their classroom via the virtual world inside the Motion Houses, thanks to the use of Studio Aurasma. In addition to children reaching outside the classroom, teachers were able to do so as well. The teachers were able to affect other teachers in the county, as the lesson was shared via a post on an ITRT blog to share with other teachers, sharing our experience and lesson with others, hopefully spurring them on to try out a new technology in their own classrooms. Lastly, using Studio Aurasma has allowed the teacher to utilize the app in other lessons and hopefully teach and inspire other teachers to do so at the technology conference this summer. Owen’s drill explanation from on Vimeo. The students at our school love to play the instruments and love to be outside. So, I asked two of the 5th grade classes a question, “How could we create an outdoor music “play” ground?” The students were intrigued and began brainstorming ideas of how to build instruments out of everyday and recycled materials. 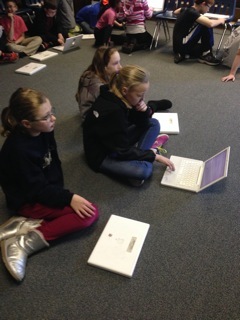 The students worked in collaborative groups to research such instruments using digital resources and the laptops. The teacher presented the 4 elements of sound; pitch, timbre, duration and volume and how each plays an important part when building an instrument. Students complied a Google Doc including planned instruments, materials needed, measurements and amounts of materials to share their ideas with the other 5th grade class. Ideas were discussed and compiled to come up with the exact instruments the classes would build and what materials would be needed. Students then implored the efforts of parents, PTA, and outside businesses to actually build the instruments. The outdoor music “play” ground will benefit all students at our school. This project is Ideal/Target in Research and Information. Students were shown examples of different instruments on sites and then utilized a variety of sites as well as search engines to find their own homemade instruments. Students also completed experiential research to evaluate the materials that would make their design work. Students shared their findings and information on Google Docs. This project is Ideal/Target in Communication and Collaboration. Students worked within collaborative groups to complete each task. They communicated with groups from the other class as well through their Google Docs and a shared presentation to present their findings. Students communicated with outside businesses and with parents to gain materials. They also collaborated with parents to build the instruments. Finally, students reflected on their roles as collaborators. This project is Ideal/Target in Critical Thinking and Problem Solving. Students created their own instruments. They had to consider materials and sound and come up with the BEST possible construction. Groups encountered problems along the way and had to come up with their own solutions. Students had to make decisions in their groups and then present those decisions to the class for discussion with their ideas to solve the problem. Students also had to ask parents and outside businesses for help to support the project. Students reflected on their problem solving skills. This project is Ideal/Target in Creativity and Innovation. Students used their knowledge of classroom instruments and other cultural instruments to create new ones. They were instructed to use everyday or recycled materials for the instruments, but the rest was up to them. Students had to come up with the best use of materials to make the best sound. The students set the amounts of materials needed and built the instruments. Students reflected on their choices of instruments, materials and overall project. In the course of their Virginia Studies in fourth grade and their study of Henrico County in fifth-grade, students were familiar with both the Virginia Trekkers and Henrico Trekkers web sites and videos. While learning about Henrico County Public Schools, students delved into the unique history of their own school by reading and synthesizing information from a 30 year old publication written for adults as well as “interviewing” a citizen who was a student at the school in the 1950s. Students then took this information and produced short video clips to disseminate the information learned about the history of their school to the public beyond their classroom. Research and information fluency were not the focus of this lesson. Students did, however, apply research skills when reading, synthesizing, evaluating, and organizing the information from the source provided and when constructing interview questions. This lesson falls in the ideal/target range. While the students worked in teacher-selected groups, they were not assigned specific roles/jobs. Students had to communicated effectively with one another by reading, listening, sharing ideas, listening to the ideas of others, and working cooperatively to analyze and decide which information they wanted to share. Then, they had to synthesize the information into their own thoughts and words in order to make it interesting and understandable to the public, including primary elementary students. After uploading the videos, students were able to view their own final products and those of others and were then able to reflect on their effectiveness as communicators and collaborators. Students not only contributed information to the outside world on our blog, they also brought in and incorporated information from the outside world in with our guest speaker. This lesson falls in the ideal/target range. Students had to justify their opinions and reasoning with the members of their group as part of the process of coming to consensus on what to share. Students were completing an authentic task of assimilating and presenting information on the history of their own school. When they viewed their own final products in relation to others they had an opportunity to reflect on their own roles and evaluate their own success. This lesson falls in the ideal/target range. Students created meaningful, original work within the assigned parameters. Students also synthesized existing information to create a new product (video) within assigned parameters. Students were asked to create a festival that centers around the pumpkin. After completing research students are required to develop a plan for their festival that meets requirements. Their final product is a photobooth video. The video must be persuasive and informative. The videos were posted to the class blog and voted on. This lesson falls into the Ideal/Target category for research and information fluency. The students are required to come up with their own questions to research. They were also required to select the most appropriate digital tools to help them answer their questions. They were required to assimilate the research that they completed into a cohesive and persuasive advertisement for their festival. This lesson falls into the Ideal/Target category for communication and collaboration. Students were required to establish group norms and group roles to appropriately divide the work that they were doing. They were required to use work together using a digital tool to collaborate with others. Students reflected on their products as well as their process. This lesson fits into the Ideal/Target category. During this lesson students were required to write their own questions about their subject matter and then find the appropriate answers to their questions. They then had to synthesize this information and put it into a format for others to understand. Students have to find appropriate pictures that enhance their content and complete the task assigned. Students were required to complete a reflection at the end. This lesson falls into the Ideal/Target category. Students were required to complete an authentic task of how to design a festival that would be appealing to others. Students were required to research festivals and pumpkins. They then had to synthesize information that they researched and plan a festival that was based on this new information. They then had to put all of their ideas into a format that was visually appealing, informative, persuasive and fun. Student videos were shared on the classroom blog where others viewed them and voted for the festival that they would most like to attend. After viewing survey results, students completed a reflection to see if their final products met the challenge and were effective in the communication of the assignment. Morgan, Vineet, Emma L. from on Vimeo. What is an entrepreneur’s role in our economy? This student-centered project allowed students the authentic opportunity to use their knowledge of our economy and become entrepreneurs. The students were grouped based on student choice. Each individual designed his/her own product and collaborated with peers to formulate the name of their business, their mission statement, and a business plan. They synthesized information from the Internet to design innovative products. The individuals also reflected (self/peer) throughout their time in the project using face-to-face communication, as well as Google Documents. This was a significant piece to the process, as they set goals for future growth. The students had experts’ guidance along the way (specifically in advertising, marketing, logo design, and owning your own business or CEO). Moreover, students collaborated with the Virginia Council on Economic Education at their culminating event at the VCU Siegel Center. Students also used their critical thinking and problem solving skills in order to make a profit and become successful entrepreneurs. The students will also participate in the West End Farmers’ Market; it will be student-driven. The students will come up with where the earned US currency will go. Lastly, the students used their knowledge to create new product ideas that would meet the demand of the economy. In the end, each business will design a presentation that they will present to adults who have various business experience. The judges will score each business based on the following criteria: originality, sell-ability, profitability, customer-base, and sustainability. This lesson falls in the Ideal/Target range. The teacher introduced the concept of advertising and different ways to persuade. The student found authentic examples, through research, of each kind of advertising technique in the real world. Students discussed the advantages and modified their advertising accordingly. The students also used research through experts. The experts came in to our classroom in the areas of marketing/advertising, logo design, and owning your own business (CEO). Thereafter, the students went to findmylogo.com and researched different ways to design logos. Next, the students designed their own logos on the laptops. This lesson falls in the Ideal/Target range. Students will be collaborating with one another to create and implement a business plan. They will also be communicating as businesses through commendations and recommendations. They selected Google Documents to do part of this. They will modify their businesses accordingly. Experts in the advertising, marketing, and logo creation fields came to the classroom on various days to communicate their knowledge to the class. The students used this knowledge for future growth. Lastly, they will communicate with local business people in the Richmond area as they present their sales pitch. After the presentations, the local business people from our area will score the seven businesses. This lesson falls in the Ideal/Target range. One of the goals of the project is for each business to be successful in selling their products. Students must use their critical thinking and problem solving skills in order to create and modify products based on the market and sales. It will be necessary that students understand and implement the basic elements of economics, such as supply and demand and opportunity costs. This lesson falls in the Ideal/Target range. Each business determined a type of product that they would sell. Creativity and innovation were necessary in determining the products to be sold. In addition to creating the products, the student had to design an advertising campaign to market their product. All products were student-generated. Students embarked on this project after learning about various famous people for social studies (famous Americans, world explorers, and people of influence). Student choice was key in selecting a person with whom they would research, wonder about, and connect. Students had the opportunity then to collaborate with members from the other third grade classes with whom they shared the same famous individual creating effective research “Think Tank” groups. Two different library lessons provided a scaffold for the students to craft researchable questions and move through different phases of research requiring them to utilize multiple levels of Bloom’s Taxonomy. Students utilized a variety of developmentally appropriate, curated research tools and print resources to explore, evaluate, and gather their information. With foundational information and insight, students worked in their “Think Tanks” to share information, raise thought provoking questions, and establish their own personal connection to their individual. They utilized their information packets to develop a written speech, design a costume, and ultimately assume the essence and persona of their famous individual. As a culminating activity the students participated in a parade through the school and a Living Wax Museum for parents and other students. Students worked together to record each other’s speeches using iPads. Finished files were uploaded to their class blogs and will be used for self-assessment, reflection and review for testing. As instruction continues throughout the year, students are tapped as “experts” to co-teach content with classroom teacher. Through research lessons completed with the librarian and classroom teachers, students worked in Think Tank groups according to their selected famous individuals. They learned the difference between “level one research”, which allowed them to find the required information via print and online resources, and “level two research”, which challenged students to incorporate all levels of Bloom’s Taxonomy as they came up with their own “wonder” questions in order to find connections with the individuals both to themselves and current America. Primary sources such and photographs and artifacts were researched and analyzed to design authentic costumes and accessories. By doing this in Think Tank groups, teachers were able to facilitate and formatively assesses authentic tasks while students were engaged in research and using information fluently with one another. Students were also able to “work smarter and not harder” in their Think Tanks to assemble and synthesize information in order to address authentic tasks necessary to “become” their individuals. By using the Symbaloo as well as printed materials made available in common spaces, children were able to select from a wide variety of tools to powerfully display and use their information to complete their transformation. tools including a Symbaloo specifically created for this project as well as other online resources to communicate and collaborate with peers. During library lessons, students collaborated to compile information together to effectively showcase their research. Frequent student discussions and questioning allowed them to become the experts. Using iPads, students recorded their speeches and were allowed to review their presentations in order to reflect on their role as a communicator and then set goals for future growth on other projects and presentations. This allowed for self-reflection as students self-critiqued for clarity and content. Recorded speeches were also archived on classroom blogs for future instruction and test review. The goal in this process was for students to become their chosen individual. This required them to use meaningful questioning, critical thinking and problem solving to come up with interesting, accurate, and relevant information about their famous person. They were also challenged with the requirement to make a personal connection with that person, as well as finding their relevance to the world today – what could have happened if a major part of their life was changed either by choice or circumstance. After recording themselves and watching their peers’ presentations, students were able to reflect upon their effective use of information, their ability to communicate their learning, and how they could have been more convincing in their roles. Students synthesized their self-generated questions by creating their own scripts to present at the Living Wax Museum. By creating costumes and making props, new ideas and products were created allowing students to convincingly portray their character. The final product was a truly authentic task as students were able to creatively express their learning in “live” and recorded formats using accessories and researched information they felt best represented their historical figure. Students learned that only 0.5% of our oceans have been explored. They were challenged as oceanographers to explore the depths of the ocean. They had to document their adventure as they traveled between the zones of the ocean. 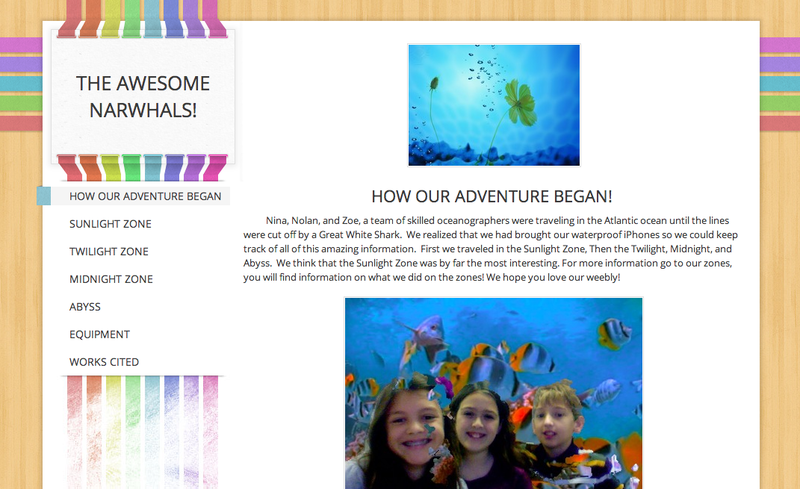 When they returned to the surface they would put together a webpage to show others what they found. This lesson falls into the Ideal/Target category for research and information fluency. The students are required to come up with their own questions to research. They were also required to select the most appropriate digital tools to help them answer their questions. They were required to assimilate the research that they completed into a cohesive and informative website. This lesson falls into the Ideal/Target category for communication and collaboration. Students were required to establish group norms and group roles to appropriately divide the work that they were doing. They were required to use work together using a digital tool to collaborate with others. Students shared their findings by collaboratively developing a visually appealing website to document their ‘journey’. Students reflected throughout the process. This lesson fits into the Ideal/Target range. During this lesson students were required to write their own questions about their subject matter and then find the appropriate answers to their questions. They then had to synthesize this information and put it into a format for others to understand. Students have to find appropriate pictures that enhance their content and complete the task assigned. Students were required to reflect during the creation of their website to make design and content decisions as well as complete a reflection on their processes at the end. This lesson falls into the Ideal/Target range. Students were required to complete an authentic task of how to give information to others in an interesting and creative way. Students were required to synthesize information and put it into a format that met the challenge, told a story and was easy for others to understand. They were also required to find visuals that were appropriate to the subject matter and enhanced their text. After sharing the weeblies, students completed a reflection to see if their final products met the challenge and were effective in the communication of the assignment. Students are presented with the following problem: A classmate has moved away to a location where pumpkins cannot grow. You have to decide how we can safely ship a pumpkin to our friend. First students investigate the properties that might impact safely sending this pumpkin. Students utilize PebbleGo to make connections with their prior knowledge of pumpkins. Students are divided into four groups and assume a defined role in order to contribute cooperatively and collaboratively. 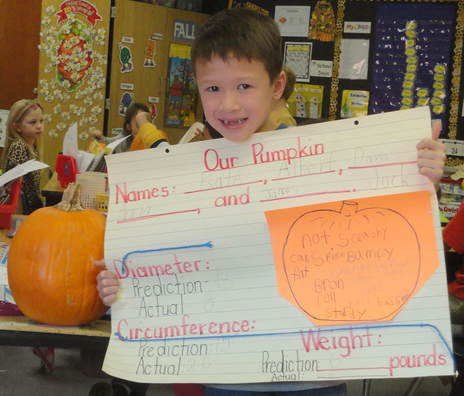 Students are involved in experiential research to discover important information that will impact decisions made for their pumpkin including: discuss/predict, then measure weight, circumference, and diameter of the pumpkins in their small groups. Students reflect on their pumpkin data and research, synthesize ideas, and collaborate to build and test their pumpkin packages. Students share the results of their experiment through the classroom blog. Research and Information Fluency were not the primary focus of this lesson. Students did participate in experiential research and utilized some digital resources to further investigate their topic. This lesson falls in the developing range for Communication and Collaboration. Students were required to work collaboratively to solve an authentic problem. Students communicated the findings of their investigation through the teacher’s blog. This lesson falls in the approaching range for Critical Thinking and Problem Solving. Students applied information gained during their experiential research to create a package that would safely and successfully transport a pumpkin if dropped from a distance of 10 feet. Students had to work collaboratively to synthesize ideas from group members to meet their design challenge. This lesson falls in the ideal/target range for Creativity and Innovation. Students utilized their experiential research to collaborate and design a package to that met the design challenge needs to transport a pumpkin safely when dropped a distance of 10 feet. Students reflected throughout the design process to synthesize group member ideas to create a cohesive package. Students further reflected on their processes after the completion of the unit. Second grade students read Flat Stanley and then created a flat version of themselves similar to Flat Stanley (Flat Twins). They Skyped with a school from Iowa to discuss their plans and brainstorm ways to share their learning experiences in new ways, and later they were able to meet with the author of the Flat Stanley series to ask questions and gain context for their project. Over a three week period students took photographs and wrote journal entries about their flat twin’s adventure. Students organized photos and writing and created a script describing their adventure. Using the iPads each student recorded a video describing their adventures. With the assistance of librarian, students uploaded component parts to the Aurasma platform, where images and videos created an ‘aura’ for each Flat Twin. Flat twins were exchanged with the school in Iowa. We used Aurasma to scan their new flat friends and learn about their adventures with their Flat Twins. This lesson falls into the Ideal/Target range. Students researched Flat Stanley author Josh Greenhut, generated questions for the author and had an opportunity to have them answered during their Skype session. Students also utilized Google Earth to research the school and area where they were sending their Flat Friends. Students also used Skype to interact with students from our partner school in Iowa to make decisions regarding how they would share information with each other about the project. After synthesizing their adventures into a script, then creating and uploading vlogs to and augmented Reality App, students used this app to display and interact with their information, as well as to share their work with people outside our school. This lesson falls into the Ideal/Target range. Students were engaged in communication with others outside their school environment and time zone via video chatting (Skype) with multiple locations. Students had the opportunity to reflect on the Flat Stanley series to assist with the generation of questions/suggestions to the author. Students and teachers collaborated with our partner school (via Skype-students and teachers and Twitter-teachers) to work out details and make selections of appropriate processes, strategies, and tools to send and receive information about their Flat Friends. Students were also challenged to communicate their winter adventures in multiple formats beginning with a graphic organizer, scripts and finally a video recording. Students reflected on suggestions and steps in the process in between Skype sessions and made decisions based on assessing their experience throughout the process. This lesson falls into the Ideal/Target range. Students and teachers collaborated with our partner school in Iowa (via multiple Skype sessions) to select the most appropriate digital tool that would allow them to share their work. After much discussion, the decision was made to utilize the power of augmented reality to synthesize the learning experiences and allow for ease of sharing outside of our school. We also had to develop strategies that would scaffold and streamline the process of creating and manipulating the content. After shooting the videos, students and teachers had to problem solve to find a viable solution to transfer the volume of trigger images and videos from multiple devices to the app so that they could be combined and used with the scanning app. Students tried a variety of methods, assessed each to decide on the best for their needs, and then trained each other on how to use them. Individually, students were challenged to to think critically to imagine and plan their winter adventures with their 2D Flat Twin. Reflection was essential throughout the process in order to continue moving forward with the project to the next steps, or to revise the process to make it more efficient. This lesson falls into the Ideal/Target range. During the project, students were given a wide variety of found materials to select from in order to creatively design their flat twin. Students also created meaningful original journal entries and vlogs to display their creative adventures. These two elements were synthesized using an innovative tool incorporating augmented reality, which allowed them to share their learning experiences. Throughout the project, students and teachers were challenged to try various tools and strategies to facilitate the sharing of content, experiencing failure and discovering success along the way. As a result, the protocol for similar learning experiences has been developed and will be applied to future projects. Skyping with Author Josh Greenhut and our Friends from Iowa from on Vimeo. This culminating activity helps students understand the contributions of all the Famous People we have learned. First graders selected their own groups and chose a person. In groups, students became experts on their person and discussed the facts and contributions made by their person. They used a planning document to discuss their person within their groups. Students were given a choice of digital products to record their clues about their Famous American; such as, computers, Photo Booth, Pixie, and iPads. In addition to choice, students were allotted planning and scripting time for their version of “charades.” At the completion of this lesson, students viewed each project and guessed the Famous American. Lastly, they reflected on the lesson, the process of working with a group, and made plans to make improvements for the next charades opportunity. Research and information fluency was not the focus of this lesson. Students were required to utilize prior knowledge to create clues about their famous person and therefore this area was not scored. This lesson falls into the Approaching range for Communication and Collaboration. Students worked collaboratively while discussing solutions to the proposed questions. Students were engaged in great discussion and were able to clearly share their ideas and thoughts with each other. They were also excited when their peers came up with great ideas. They also had to present their project to the class. These projects will be sent to our second grade classes and they can guess the famous people. This lesson falls into the Approaching range for Critical Thinking and Problem Solving. Students had to become producers and come up with a product together to sell to their classmates (consumers). They created a project to present with the many different clues of their famous person. They had to think critically about the best way to present the information without giving their classmates the answer. In addition to coming up with clues that made sense, each group had to tell why their famous person was important. Also, students had to problem solve when they came to a disagreement during the process of creating the videos. Students had to make choices that were the best for their group and for their project. This lesson falls into the Ideal/Target range for Creativity and Innovation. Students were extremely creative with the way they presented their information/clues about their famous people. While walking around during their planning time, students were engaged in deep discussion on which facts to choose and what they have learned about each famous person. I found the reflection piece to be fascinating. Students were able to express their thoughts about the lesson and they were able to connect this lesson the real world. 2014-03-21 11.21.28.mov from on Vimeo. This work is licensed under a CC Attribution-Noncommercial-Share Alike 3.0 United States License.